American Airlines Flight 1420, from Dallas/Fort Worth (DFW) to Little Rock (LIT), was scheduled to depart about 20:28 and arrive about 21:41. However, the airplane originally intended to be used for the flight was delayed in its arrival to Dallas/Fort Worth because of adverse weather in the area. After 21:00, the first officer notified gate agents that flight 1420 would need to depart by 23:16 because of American’s company duty time limitation. Another aircraft was arranged and the flight departed at 22:40. About 22:54, the flight dispatcher sent the flight crew an ACARS message indicating that the weather around Little Rock might be a factor during the arrival. The dispatcher suggested that the flight crew expedite the arrival to beat the thunderstorms if possible, and the flight crew acknowledged this message. About 23:04, the Fort Worth center broadcast an NWS Convective SIGMET [significant meteorological information] weather advisory for an area of severe thunderstorms that included the Little Rock airport area. The flight crew discussed the weather and the need to expedite the approach. At 23:25:47, the captain stated, "we got to get over there quick." About 5 seconds later, the first officer said, "I don’t like that...that’s lightning," to which the captain replied, "sure is." The flight crew had the city of Little Rock and the airport area in sight by 23:26. Fort Worth center cleared the flight to descend to 10,000 feet msl. The flight was transferred to the Memphis ARTCC and at 23:34, the flight crew contacted the Little Rock Air Traffic Control Tower (ATCT). The controller advised the flight crew that a thunderstorm located northwest of the airport was moving through the area and that the wind was 280º at 28 knots gusting to 44 knots. The first officer told the controller that he and the captain could see the lightning. The controller told the flight crew to expect an ILS approach to runway 22L. At 23:36, the captain and first officer discussed American Airlines’ crosswind limitation for landing. The captain indicated that 30 knots was the crosswind limitation but realized that he had provided the limitation for a dry runway. The captain then stated that the wet runway crosswind limitation was 20 knots, but the first officer stated that the limitation was 25 knots. At 23:39:00, the controller cleared the flight to descend to an altitude of 3,000 feet msl. The controller then asked the flight crew about the weather conditions along the runway 22L final approach course, stating his belief that the airplane’s weather radar was "a lot better" than the weather radar depiction available in the tower. At 23:39:12, the first officer stated, "okay, we can...see the airport from here. We can barely make it out but we should be able to make [runway] two two...that storm is moving this way like your radar says it is but a little bit farther off than you thought." The controller then offered flight 1420 a visual approach to the runway, but the first officer indicated, "at this point, we really can’t make it out. We’re gonna have to stay with you as long as possible." At 23:39:45, the controller notified flight 1420 of a windshear alert, reporting that the centerfield wind was 340º at 10 knots, the north boundary wind was 330º at 25 knots, and the northwest boundary wind was 010º at 15 knots. The flight crew then requested runway 04R so that there would be a headwind, rather than a tailwind, during landing. At 23:40:20, the controller instructed the flight crew to fly a heading of 250º for vectors to the runway 04R ILS final approach course. After reaching the assigned heading, the airplane was turned away from the airport and clear of the thunderstorm that had previously been reported by the controller. Between 23:40:46 and 23:41:31, the first officer stated the localizer frequency and course, the decision altitude, the minimum safe altitude, and a portion of the missed approach procedure for runway 04R. The captain then asked the first officer, "do you have the airport? Is that it right there? I don’t see a runway." At 23:42:27, the controller told the flight crew that the second part of the thunderstorm was apparently moving through the area and that the winds were 340º at 16 knots gusting to 34 knots. At 23:42:40, the first officer asked the captain whether he wanted to accept "a short approach" and "keep it in tight." The captain answered, "yeah, if you see the runway. ‘cause I don’t quite see it." The first officer stated, "yeah, it’s right here, see it?" The captain replied, "you just point me in the right direction and I’ll start slowing down here." At 23:42:55, the first officer said, "it’s going right over the...field." The first officer then told the controller, "well we got the airport. We’re going between clouds. I think it’s right off my, uh, three o’clock low, about four miles." The controller then offered a visual approach for runway 04R, and the first officer accepted. At 23:43:11, the controller cleared flight 1420 for a visual approach to runway 04R and indicated "if you lose it, need some help, let me know please." At 23:43:35, the first officer stated, "you’re comin’ in. There’s the airport." Three seconds later, the captain stated, "uh, I lost it," to which the first officer replied, "see it’s right there." The captain then stated, "I still don’t see it...just vector me. I don’t know." At 23:43:59, the controller cleared flight 1420 to land and indicated that the winds were 330º at 21 knots. At 23:44:19, the captain stated, "see we’re losing it. I don’t think we can maintain visual." At 23:44:30, the first officer informed the controller that visual contact with the airport had been lost because of a cloud between the airplane and the airport. The controller then cleared the airplane to fly a heading of 220º for radar vectors for the ILS approach to runway 04R and directed the flight to descend to and maintain 2,300 feet msl. At 23:45:47, the first officer told the controller "we’re getting pretty close to this storm. we’ll keep it tight if we have to." The controller indicated to the flight crew that, "when you join the final, you’re going to be right at just a little bit outside the marker if that’s gonna be okay for ya." The captain stated, "that’s great," and the first officer told the controller, "that’s great with us." At 23:46:39, the controller advised the flight crew that the airplane was 3 miles from the outer marker. At 23:46:52, the captain stated, "aw, we’re goin’ right into this." At the same time, the controller reported that there was heavy rain at the airport, the ATIS information in effect at the time was no longer current, the visibility was less than 1 mile, and the runway visual range (RVR) for runway 04R was 3,000 feet. The first officer acknowledged this information. At 23:47:08, the controller again cleared flight 1420 to land and indicated that the wind was 350º at 30 knots gusting to 45 knots. The first officer then read back the wind information as 030º at 45 knots. At 23:47:22, the captain stated, "three thousand RVR. We can’t land on that." Four seconds later, the first officer indicated that the RVR for runway 04R was 2,400 feet, and the captain then said, "okay, fine." At 23:47:44, the captain stated, "landing gear down." About 5 seconds later, the captain stated, "and lights please." At 23:47:53, the controller issued a second windshear alert for the airport, reporting that the centerfield wind was 350º at 32 knots gusting to 45 knots, the north boundary wind was 310º at 29 knots, and the northeast boundary wind was 320º at 32 knots. This transmission was not acknowledged by the flight crew. At 23:48:10, the captain stated, "add twenty [knots]," to which the first officer replied, "right." At 23:48:12, the controller reported that the runway 04R RVR was now 1,600 feet. About 23:48:18, the captain indicated that the flight was established on final approach; 6 seconds later, the first officer informed the controller that the flight was established on the inbound portion of the ILS. The controller repeated the clearance to land; stated that the wind was 340º at 31 knots, the north boundary wind was 300º at 26 knots, and the northeast boundary wind was 320º at 25 knots; and repeated the RVR. At 23:48:41, the first officer acknowledged this information. The controller did not receive any further transmissions from flight 1420. At 23:49:02, the first officer asked the captain, "want forty flaps?" The captain indicated that he thought he had already called for the landing flaps, after which the first officer stated, "forty now." At 23:49:10, the controller informed the flight crew that the wind was 330º at 28 knots. Two seconds later, the captain stated, "this is a can of worms." The first officer stated, "there’s the runway off to your right, got it?" at 23:49:24. The captain replied, "no," to which the first officer stated, "I got the runway in sight. You’re right on course. Stay where you’re at." The captain then stated, "I got it. I got it." At 23:49:32, the controller reported the wind to be 330º at 25 knots. At 23:49:53, the controller reported the wind to be 320º at 23 knots. From about 400 feet above field level (afl) the airplane drifted to the right. At 23:50:00, the first officer said, "we’re way off." The localizer deviation value was about one dot to the right at that point. About 1 second later, the captain stated, "I can’t see it." About 3 seconds afterward, the first officer asked, "got it?" to which the captain replied, "yeah I got it." At 23:50:13 and :14, the GPWS radio altitude callout "sink rate" sounded. The airplane touched down on the runway about 23:50:20. About 23:50:22, the first officer stated "we’re down;" about 2 seconds later, he stated, "we’re sliding." Over a 7-second period after touchdown, both thrust reversers were deployed and the left and right engines’ engine pressure ratios (EPR) reached settings of 1.89 and 1.67, respectively. The thrust reversers were subsequently moved to the unlocked status (neither deployed nor stowed). The flight spoilers did not deploy symmetrically at touchdown. About the time that the brakes were applied, the thrust reversers were deployed again. At 23:50:32, the CVR recorded an unidentified voice in the cockpit stating "on the brakes." The left engine reached a maximum setting of 1.98 reverse EPR, and the right engine reached a setting of 1.64 reverse EPR. The left brake pedal was relaxed at 23:50:34 before returning to its full position 2 seconds later. About the time that the left brake pedal was relaxed, the reversers were returned to the unlocked status. As the right thrust reverser was being moved to the unlocked status, the right engine reached a maximum setting of 1.74 reverse EPR. At 23:50:36, a full aileron deflection was given. At 23:50:40, the left thrust reverser was moved back to the deployed position, but the right reverser moved briefly to the deployed position and then moved to the stowed position. According to FDR data, the left thrust reverser remained deployed, and the right thrust reverser remained stowed, for the remainder of the flight. After departing the end of the runway, the airplane struck several tubes extending outward from the left edge of the instrument landing system localizer array, located 411 feet beyond the end of the runway; passed through a chain link security fence; went down a rock embankment to a flood plain, located approximately 15 feet below the runway elevation; and collided with the structure supporting the runway 22L approach lighting system. PROBABLE CAUSE: "The flight crew's failure to discontinue the approach when severe thunderstorms and their associated hazards to flight operations had moved into the airport area and the flight crew's failure to ensure that the spoilers had extended after touchdown. 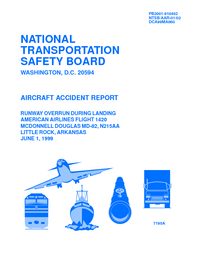 Contributing to the accident were the flight crew's (1) impaired performance resulting from fatigue and the situational stress associated with the intent to land under the circumstances, (2) continuation of the approach to a landing when the company's maximum crosswind component was exceeded, and (3) use of reverse thrust greater than 1.3 engine pressure ratio after landing. " Twenty-two safety recommendations were issued to the FAA (and another two reinstated); and two issued to the National Weather Service. Recommendations included a.o. changes to procedures regarding automatic spoiler systems; access to weather information; communications between ATC and ARFF. Distance from Dallas/Fort Worth International Airport, TX to Little Rock National Airport, AR as the crow flies is 486 km (304 miles).